Let us help you preserve your own or a loved one's memoirs and family stories for generations to come. There is no legacy more valuable. This is a photo of my maternal grandfather, taken when I was an infant. Eldon Roe was a poet, a farmer, a doting grandfather, an advocate for world peace, and a consummate storyteller. He was not famous, although he had quite an ego! But he had a life's worth of stories worth saving. Unfortunately, he died when I was in college, not yet wise enough to sit down with him and record his stories. The failure to save my grandfather's stories heartens my desire to help other families preserve their own stories, before they are lost. 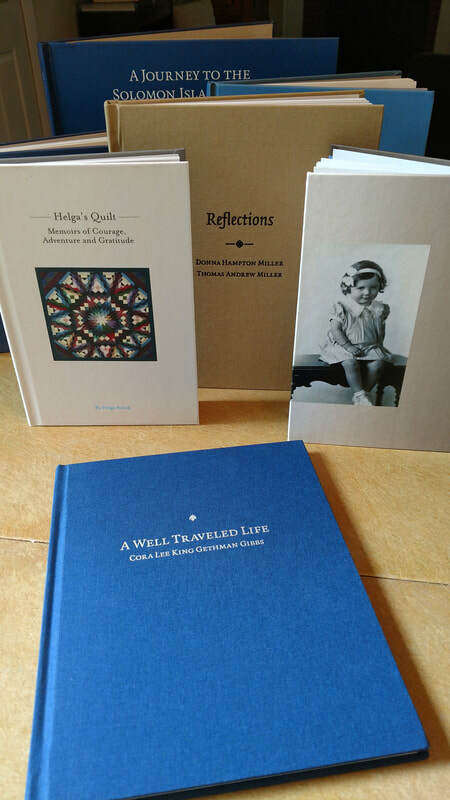 Merrill Memoirs conducts in-depth (and enjoyable!) interviews with one or more "storyteller" in order to craft a compelling narrative. Working with a professional genealogist, we enrich the narrative with historical information. The story may describe a life, a family history, a marriage, or a journey. It is your story, told in your words. Many of our clients preserve these narratives in a beautifully designed book, alongside photographs and memorabilia. Families also have the option of purchasing the interviews as edited recordings. Our clients truly enjoy the interview process and have great things to say about the experience and the products: See our TESTIMONIALS page. We offer free telephone or in-person consultations, if you'd like to learn more.